Hey guys, happy Monday! It was another beautiful weekend in Dallas (yippee!). I tried to take full advantage of it by being outside as much as possible. Saturday I got plenty of outside time. I had a 1 & 2 year old joint birthday party of mine and my sisters childhood friends. The party was amazing. It was circus themed and of course it was decked out! I'm sure my friend Cass will be posting photos and such on her blog, so feel free to check her out HERE (she's awesome). After the party I had a dinner date planned with my two girlfriends (Katie and Kaytie) for Katie's birthday. It was much needed and we had the best time. Dinner actually turned into a 4 hour date. That's typical, right?! We enjoyed a nice dinner on the patio of Mi Cocina and then hit up a local bar to continue our chatting. I love my girls. It really was the perfect Saturday. And then it was Sunday, just like that. Church, house hunting, blog photos and then hanging out with my two guys. Perfect. Anyway, so about today's outfit. I have been wanting this t-shirt since I first saw it while browsing through Pinterest. It is the cutest thing and I finally got it! Eek! It's from Broke Rich Girls and they have a ton of other super cute tees as well. Definitely check them out. And I'm doing some serious Texas reppin'... how cool is that art?! Another new piece in Deep Ellum and I couldn't resist it. 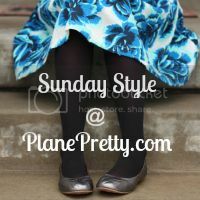 Side note - I linked up (it's pretty much a daily thing) over at Plane Pretty... check it out! Love everything about this! The cute tee, the booties, the graffiti! Very cute! Thanks for the shout out, Scootie! I dig this outfit. I'm totally loving the green pants. Bought some the other day from Maurices, but they aren't skinny like those. I'm loving this whole look and the amazing photos and artwork. You look gorge, as always! Thanks for coming to the party!!! Thanks Cass! The party was so much fun. :) I've had these green pants for a while now, but recently I've started wearing them more often. Now I wish I would have gotten a couple of pair in different colors. Dang it! i love that necklace its so fun!